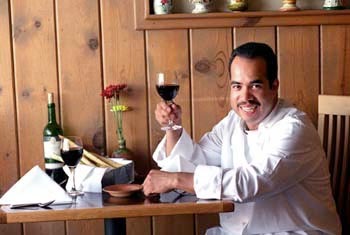 Wine Dining: Executive chef Juan Martinez raises his glass in salute--an appropriate gesture given that the wine list is a major attraction at Ristorante Avanti. NEWCOMERS and veterans alike all secretly feel that Ristorante Avanti has rolled out its cozy wine bar and acres of Mediterranean flavors just for them. And there's the ambiance--this lively restaurant's ability to feel casual while serving memorable meals is part of its charm. Avanti is one reason why the Westside of Santa Cruz still feels pleased with itself, speed bumps and traffic and all. The blackboard by the door last week listed a white bean and prosciutto soup, and fresh asparagus wrapped in Spanish ham ($6). Asparagus in season gets my vote, so that succulent appetizer joined an order of arugula salad ($6.95)--so Roman, the flavors of an entire salad made of just arugula. It's a bad mistake to ignore vegetable dishes and salads when at Avanti. They showcase the best from local organic growers, and that freshly grated cheese you're offered is always parmigiano reggiano. Crusty, chewy bread lay waiting for us as we took stools at the counter for dinner last week. It's fun watching the clientele settle in from that sleek central perch, and it was more so as we sampled the evening "flight" of 1997 Tuscan red wines ($16). Jack and I totally endorse the chance to sample six different wines--similar styles, same year--and make tasting notes on the sheet provided. Besides, the bottles have had time to breathe, so the wines show their best stuff. Over the years I've found Avanti's kitchen strongest in the area of entrees. Beautiful seasonings attend fresh halibut, wild mushrooms are treated with innovation. The best dinners Avanti has to offer involve something like roasted potatoes, a sauté of gathered greens and some earthy game. The pastas can be less consistent--like last week, when my pretty plate of spaghetti with prawns and leeks ($6.95 for a half-order) proved a bit overcooked and a little less than vibrantly seasoned. Graciously, Avanti offers quite a few of its dinners in "petite" portions, a habit that allows inquiring appetites room for appetizers and that killer cheese plate. Splitting a salad of pungent arugula ($6.95), flecked with blood orange slices, pecans and nutty pecorino sardo, we enjoyed the reprieve from the ubiquitous cliché of greens, walnuts and pears with Roquefort. An orange vinaigrette enhanced what proved to be the evening's citrus theme. Jazz filled the background as we started on main courses, brought at exactly the right moment in our playful wine tasting. Jack's evening special was just that--special. Sweet and surprisingly flavorful sole ($14.95) had been expertly sauteed and sauced with shallots and grapefruit. The sweet-tart citrus was brilliant with the delicate fish, as well as with its fresh broccoli accompaniment. Ultra-creamy polenta (one of the house specialties) joined this terrific dish. I love this place. Was it true that port goes better with the cheese plate ($5.95) than red wine? Not really, but it was a worthy experiment that had us comparing a generous pour of Graham's Vintage 1980 ($10) with another of Ferreira 20-year Tawny ($9). The true winner was the green pottery plate arranged with five samples of remarkable cheese, including an amazing, complex goat cheese called Garrotxa from Catalonia, a sinful gorgonzola from Lombardy and an ethereal triple crème from Normandy. Fresh walnuts, apricots and squares of quince paste set off this meal-finishing tour de force. The last bits of Tuscan wine joined the cheeses--and the big-shouldered Il Pallazzino Chianti Classico was proclaimed the favorite. "Who would order a chocolate dessert when they could have this?" Jack exclaimed, biting the wings off the sugar cookie butterfly that came with our espressos. It was a perfect little meal. That's Avanti. Hours: Breakfast Mon.-Fri. 8-11:30am; lunch until 2pm; dinners Wed.-Sat. 5-9pm and Fri.-Sat 5-9:30pm; brunch Sat.-Sun. 8am-2pm. Wine bar open until midnight. Service: ***1/2 A hard-working company of charmers puts this trattoria at the head of the pack. Ambiance: *** For a place with minimal decor, Avanti packs a big atmospheric punch--vivacious attitude, matched by vivacious flavors. Cuisine: *** Always delicious, often inspired Mediterranean cookery, with coastal California spin. Fresh ideas that change seasonally. Overall: Avanti gives zest to the overall Santa Cruz quality of life--if only there were one on every block! From the May 10-17, 2000 issue of Metro Santa Cruz.